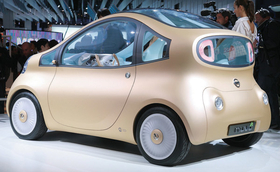 Nissan showed its Nuvu electric vehicle concept in Paris last year. In August it will unveil a concept that is closer to the production version. TOKYO -- Nissan Motor Co. wants a bold design for its upcoming electric vehicle -- one that doesn't make it look like a hybrid. The goal is a look that screams green but stands apart from the wedge-shaped silhouette that has come to signify environmentally friendly driving in the Toyota Prius and Honda Insight hybrids. "We need some kind of difference so that when people see our car, they will realize this is an EV, not a hybrid," Nissan chief designer Shiro Nakamura told Automotive News. -- No grille, to underscore the electric drivetrain. -- A low hood enabled by the lack of an engine. -- A visible recharging plug at the nose of the car. -- A profile that is flowing, instead of triangular. A concept version of the EV will be unveiled in August and will be a front-wheel-drive, five-seat hatchback, Nakamura said. The working design has a drag coefficient of 0.30, he said. The third-generation Prius has 0.25 and the Insight 0.28. Nakamura expects to eke out further improvements in drag by tweaking the design and adding underbody fittings to smooth air flow. In pursuing a design that stands out, Nakamura is taking a page from Toyota -- which gambled on the Prius' wedge shape and scored a hit when the car became the benchmark for green styling. Because EVs lack a bulky engine and gasoline tank, they open up new design possibilities. Nakamura said he couldn't maximize such flexibility because the EV uses an existing platform. He wouldn't be specific about the platform, but said the car will be comparable in size to the Cube or Versa. "It is not designed completely from scratch," Nakamura said. "We will go step by step. Later on we will bring more advanced, tires-extreme designs. We want to be economical."